The above quote was from a LJ friend, and I thought it was one of the finest I had ever seen. I think I am starting in that direction in a big way. Yesterday I started applying gesso to an Egyptian winged disk plaque that is about 24″ wide by 8″ high. I want to paint it according to the ancient canon as far as colours go. The illustration shown here is not quite right. The parts that are white should also be yellow or gold. I am seriously thinking of going with gold leafing on this one just because I can. I will need some crown moulding to make it perfect, and those have an artistic canon as well. That project, since there are two of them, should keep me busy off and on. There is no push on it. But it is nice, relaxing, busy work when I need a break from writing. Everyone does their new year’s resolutions, and of course, I am no different. I resolve that I will write daily, at least the three page per day minimum via the “Artist’s Way” by Julia Cameron. I have been encouraged with some recent comments that it might well work and I can get my work out there, uploaded to Kindle Digital Platform. I am scared to death of the damned thing because after having uploaded the Rune book to KDP, and immediately having to take it down because the illustrations didn’t get uploaded really made me nervous. I need to check and see if there are online tutorials on YouTube or something just for me to get over my primary fear. No doubt I can generate content. I just have to edit it and make it make sense to a readership that would be willing to follow what I write. One of my friends who writes mystery novels said that a book that was previously rejected by the six big publishing houses netted him over $7K in a single day this holiday season. In three weeks from Christmas onward he made $100K No. That is not a misprint on my part. JA Konrath really did make that much, and the Amazon sales figures bear out he has been in the top 100 Kindle downloads for a number of months. Tenacity pays off – as does good cover art, free downloads from time to time and value-added content. Self publishing is for me, as it is for so many others these days. Writers, artists and musicians now have control over their own content in a way like never before. I say it’s about damned time! As for the rest, I am going to be finishing up my final semester this spring and then transferring to the University of Iowa. I want to finish out my degree in Communications / Media, specializing, particularly in cinematic arts, because I truly love it. Gimme a camera, let me paint with light and a non-linear editor. In the midst of all that, I still continue to write. I have to. It’s like breathing, really. My problem is, I have far too many blogs on far too many platforms. I have a blog here on WordPress and blogs on Dreamwidth, Blogger, Livejournal and Pan Historia. I need to be better about crossposting between them. Then again, I have my preferences for each for various reasons. With the start of the semester tomorrow, I am going to have more than enough to keep me busy both in assignments and also my own personal writing goals each week. Two friends on my Dreamwidth reading list mentioned the below blog project and I have to say I was intrigued. Things have changed for me spiritually, professionally and academically. I can’t really go into it right now because I have had a good long think about it but haven’t reached any conclusions. I am still devoted to film and media as I ever was. It is just focusing on my own projects as never before. 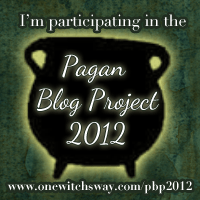 But this Pagan Blog Project seems as if it would be right along the lines of helping me get back into writing in a magical sense. Those who know me know how much a part all of that is to me and to my life. Fictionalising it is not a stretch and if anyone fears that I would give away any “oathbound” material, suffice it to say, I know what to do and what not to do – and the Mysteries DO protect themselves. Anyway, here is the link for any who would like to join up themselves.